A boldly colored game bird native to Europe and Asia, the chukar was introduced to North America in the western parts of the United States and Canada in the late 1800s through the 1930s. It is now well established and thriving in many areas, bringing a unique and exotic sighting to many birders. Markings: Genders are similar though males are larger and have a small spur on each leg. The face is marked with a black band that extends through the lores and eyes, along the cheeks and into a sharply defined necklace across the upper breast. A white eyebrow can be visible above that band, and a small brown auricular patch can occasionally be seen. The chin and throat are buff-yellow while the crown, back, rump and wings are gray-brown. The tail is gray with chestnut outer feathers, most easily visible in flight. The abdomen is buff-yellow and the flanks are heavily, vertically barred with chestnut, black and white. The undertail coverts are a pale chestnut. The eye is dark but surrounded by a bright red eye ring, and the legs and feet are reddish. Juvenile birds look similar to adults but lack the barring on the flanks and have more overall mottling on their plumage. Chukars prefer arid, open habitats including plains, plateaus and rocky canyons with only scattered shrubby brush for occasional cover, though they are adept at taking shelter in rocky crevices. They can be found at up to 10,000 feet elevation, and while these birds do not migrate seasonally, they may descend to lower elevations in the winter months, particularly during periods of heavy snowfall. 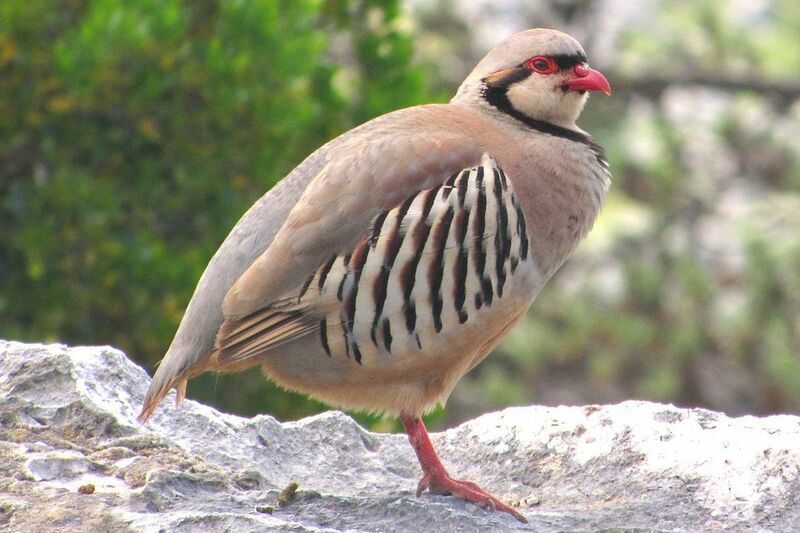 The chukar's native Eurasian range extends from Turkey to China, including parts of southern Russia and northern areas of Pakistan and India. In North America, chukars can be found in the Rocky Mountain area extending from southern British Columbia through Nevada and Utah to eastern Wyoming, as well as in central southern California. Sightings well outside the chukar's range and typical habitat are generally a result of game bird releases for hunting purposes, or escaped birds from exotic collections or game bird facilities. These birds are not exceptionally vocal but do have a raspy, loud “chuk-chuk-chuk” call that can be quite rapid and repeated for many syllables, particularly when the birds are agitated or alarmed. Other soft clucks and similar calls can also be heard. These are terrestrial birds that are more likely to run from a perceived threat, but when they do take flight they often stay low to the ground and fly with a series of very rapid wing beats followed by a glide. They can be found in small groups year-round but are more gregarious in winter, when flocks can grow to 40 or more individuals. When they are not feeling threatened by hunting, they may perch boldly on rocks and can position lookout birds to watch over the rest of the foraging flock. These are mostly monogamous birds, though some isolated cases of polygamy have been recorded. The female will construct a shallow scrape nest lined with feathers or dry grasses in an area where it is sheltered or concealed by a nearby shrub, grass clumps or rocks. The eggs are creamy yellow or yellow-white flecked with small brown spots, and there are 10-21 eggs per brood. A mated pair will raise only one brood per year. The female parent incubates the eggs for 22-24 days. The young chicks can leave the nest rapidly, in just a few minutes if necessary, but do not fly until approximately two weeks of age. These are not typical backyard birds, but are readily attracted to reliable water sources or to areas of spilled grain, especially in unexpected areas where released game birds may wander. If chukars are regular backyard guests, they will appreciate cracked corn offered on the ground or in low platform, dish or tray feeders. The chukar is not threatened or endangered, but wild populations can be vulnerable to harsh winters. In many areas, chukars are closely managed as game birds for hunting, and may even be specially bred to be released for a controlled hunting season without harshly impacting native populations.